The perfect storage solution for the congested office spaces: FCR Binder from Fichet-Bauche is a range of ring binder filing cabinets providing certified fire protection for up to two hours and optimising storage capacity. Fire events can happen to anyone and no one is safe from the damages a fire can cause. You need to keep your important documents free from fire risks but not at the cost of ergonomic design and office space. FCR Binder from Fichet-Bauche offers a low-weight filing cabinets designed for the storage of ring binders. The range has been tested, approved and certified for up to two hours’ fire protection by the UL (Underwriter’s Laboratories) according to Standard 72 Class 350. 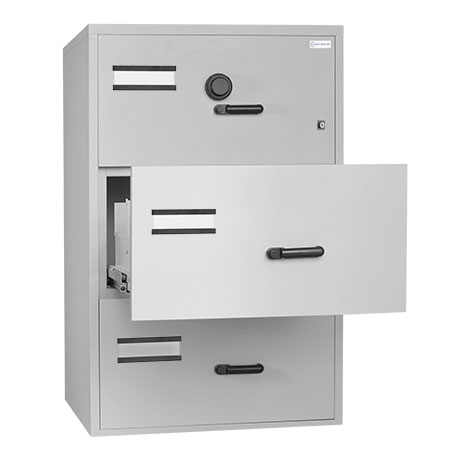 You can choose between three of four-drawer models, each drawer holding up to 40 A4 DIN 33mm binders. The drawers are independently insulated and can be fully opened to allow you maximum access to their contents. FCR Binder is constructed for strength and stability with an anti-tipping device and day-catch system.